During the siege of Malta in 1941, the Italian Supermarina and Regia Aeronautica repeatedly attempted to interdict the island's supply line by attacking the various convoys loaded with troops and supplies. One small convoy of six merchant ships and a fleet fuel carrier set sail with Force H from Gibraltar on July 21, 1941 during Operation Substance (Scenario 22 in Bomb Alley), and reached the island in spite of the Regia Aeronautica's best efforts. 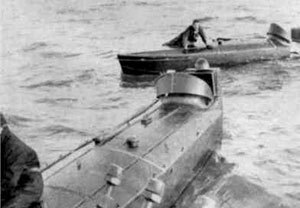 Galled by the British success, and the ineffectiveness of their planes, the Italians decided to risk a night attack on the Maltese port itself with motorboats and manned torpedoes. Italian explosive motor boats of the X Flotilla. The Italian navy had a long and successful history with the use of light auxiliary craft in operations against their enemies, from the sinking of the Viribus Unitis in World War I to the manned torpedo attacks in Alexandria harbor during World War II, crippling the British battleships Valiant and Queen Elizabeth. The unit responsible for conducting these operations was the Decima Flottiglia Mas (10th Light Flotilla), utilizing everything from one-man explosive motor boats (EMBs, equipped with an ejector seat for the crewman) to two-man submersibles called maiale ("pigs") � which carried two divers and explosive charges which would be laid below the keel of an enemy ship � to high-speed motor torpedo boats (MTBs). During the first year of the war in the Mediterranean, Decima Flottiglia Mas had conducted numerous successful operations, including an attack on Gibraltar, the sinking of the HMS York in Suda harbor during the battle for Crete, and the operation against Alexandria. On the night of July 25, 1941, the fast naval auxiliary Diana departed from Augusta in Sicily carrying eight EMBs. Joining her were two MTBs, each towing a �pig.� The plan was to have the �pigs� breach the outer defenses of the Grand Harbor, allowing the EMBs to reach the defenseless merchant ships inside the port and sink them. A diversionary air raid would be carried out to cover the approach of the small boats. Rudolf Claudus, Ufficio Storico della Marina Militare. Diana stopped about 20 miles from Malta and dropped off the EMBs, which together with the MTBs proceeded toward the Grand Harbor. Major Teseo Tesei and his crewman Chief Diver Pedretti were to blow up a section of the viaduct at the foot of Fort St. Elmo, which would give the EMBs access. Luck seemed against the operation from the beginning. 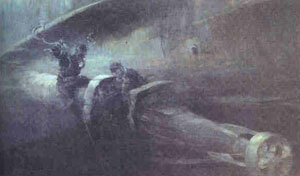 Diana was picked up by British radar, alerting the defenders to the possibility of action. Then the covering air raid ended far too soon. By the time Tesei exploded his charge on the viaduct, the island's defenders were like the proverbial angry hornets defending their nest: The Royal Malta Artillery, armed mostly with 6-pounder pom-poms, 40mm Bofors and various small arms, snapped on searchlights and opened a huge volume of fire on the entrance to the Grand Harbor. During the ensuing �battle,� only one of the EMBs seems to have gotten anywhere near the harbor entrance, only to explode against the viaduct, causing its span to collapse into the water and block the way into the port. The remainder were shot to pieces by the Maltese gunners, who had anticipated a surface attack for months and were just itching for an opportunity to pay back the Italians. 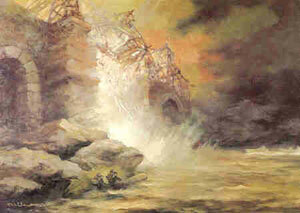 Within two minutes, every boat was sunk and most of the attackers dead. Tesei�s pig explodes against St. Elmo�s bridge.